good Sargent study, I must go find that painting! Sargent study is tight! How long did you spend on it? That's 2 and a half hours, standing, my legs were killing me! The room next has another sargent painting, a bunch of WWI generals standing around, which I drew last friday. And better figs. from imagination. Need to capture that natural standing. Great values on the footie study and the statue figure, where did you sketch it? The statue is at the NPG, its at the start of the hall way with all the busts. A colour study!! 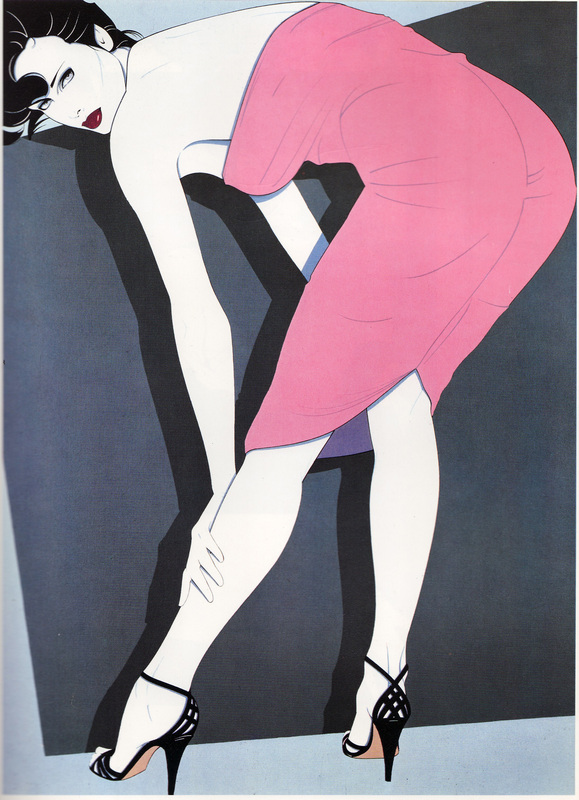 It's a Patrick Nagel study, I've liked his work for a couple of years now and I got a really hi-res piece off the net. The reason I chose this one is the pose, she's standing so I can get figure drawing and colour in one study. The downside with it is I spent around 10 hours on this (I think?). So I need to speed up. The next one will be a brown school study of some kind. Possibly Velazquez. Also some more figure drawing from imagination, the theme is office people. keep up the paintings, looking forward to see some oils and colours soon! Thank you Brandon, I've used ref for a recent character sketch in Photoshop, just for inspiration to get gesture, not directly copying. Works really well thanks. Aaaand my first Landscape (ever!) and proper colour study. Took 2 hours ~ I'm kinda pleased with it, but the foreground isn't too great. And this unoriginal scientist concept from imagination. Switching to photoshop for imaginative gestures from now on due to poor lighting. notice how you shade the transition between the nose and the eyebrows, the shaded area of the nose doesn't really connect with the eyebrows most of the time, and not in your lighting situation. Last edited by Vatsel; December 7th, 2010 at 06:16 PM. Hey thanks for the crit Mark, but I'm having some trouble comprehending the first part of it. The primary light source is coming from her right, so the shadows are located on her left hand side, where there is no (or much weaker) light. Her facial structure is such that the light can't reach the left side of her nose, and is therefore in some shadow. Please do give examples of what you mean though. Update tiem. A 2 hour landscape, need to do more, get quicker. And a style study for this Star Wars comic. I personally think its good, I'm gonna use this style. Yes it is very similar to Patrick Nagels. Oh yes, is it better with or without the armour? Latest landscape is ace! Don't worry about speed too much, you'll get faster the more you do. I think Vatsel is saying the shadow makes it look like the nose plane goes straight into the forehead, it kinda appears the plane at the top of the nose is missing? More landscapes on their way. Yes I totally see that adding an extra colour might help with bits of the clothing. I don't want the colour scheme to get too complex though. Thanks, using this style puts more emotional emphasis on the subject, as in theory it leaves your mind to fill in the bits of detail. Suggestive in a way. Thought it'd be good to include the original photo. Worth every hour you put into that sculp study, progress has been made, oh yes. I did experiment with some brushes recently, need to get refined with that. I'll probably reduce the hardness a fair bit in the next landscape. Great progress Andy. If could give a crit, I would say your figures looked stretched out. This world has gravity in it, things need to push up from the ground. Perhaps picture a person as a structure. If you can keep this in mind when thinking about how the upper body connects to the lower part at the hips then this may help. ^ Agreed. some of the figures look slightly elongated, it adds to the style, but are not proportionally correct. keep posting, it's looking good! Thanks for the advice mate. I think its a compromise between having a figure rooted to the ground by gravity but also that dynamism of potential movement via gesture. Working from the ground up in a figure might be worth a shot though. I've always tended to elongate everything I draw, it verges on the stylistic I guess. I'm not sure whether to completely expunge that from my work or not. Ok finally this damn star fighter for the comic. There are earlier attempts at getting it right from orthographic views but I gave up and made it in sketchup. And this skeleton from the Hunterian museum, Charles Byrne the Irish giant, 7 ft 7. Thanks Call0ps! Not only the V&A but also the British Museum! You'll have to see the Hunterian too at some point. I've been using reference a lot more now. I used to look at others works here asking myself is that purely from imagination or reference? Now I know its sometimes just a crazy mix of both. So: Loomis and character study. Hey man, long time no see!! Some real solid studies going on here. The forms on your figures are coming along very nicely and that study of James Caviezel is luverly! Nice face idd!! good to see your progress both in digitals and in your sketchbooks, i'll say just keep up the consistent quality posts, and hope to see your oil paintings/studies up soon! Your progression...so awesome. Figures and studies are improving at a geometric rate!